Isaac Newton once stuck a needle into his tear duct to try to figure out how the eye sees light. This is true. He really did that. But still, really? Did he really have to do that? Isaac's Eye, by Lucas Hnath, playfully blends the facts of Newton's life with an equal dose fiction to explore what great people are willing to sacrifice to become great people. "Outcry, again, with the astonishing energy and grace their cast, crew, directors and writer bring to the stage, have accomplished sorcery with a few exotic ingredients, and the spark of supernatural will. Don’t miss this sublime, chilling, phenomenal drama." "Isaac's Eye succeeds in combining a decent amount of scripted depth with humor and originality, and Outcry's production is an enjoyable way to spend an evening. And it just might get you interested in delving further into the dark secrets of the enmities and peculiar personalities who illuminated the scientific laws of our world." 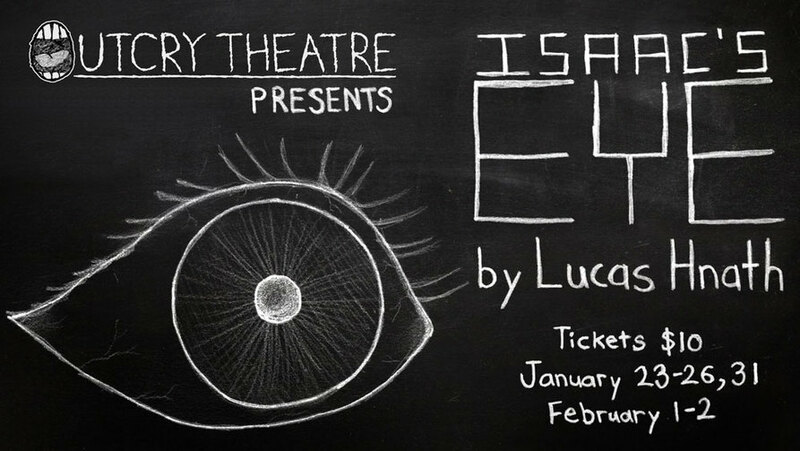 Isaac's Eye​ was presented by special arrangement with Dramatists Play Service, Inc., New York.